Home - Can Abe get Japan back on the North Korea bus? The main discourse in Japan after the Trump-Kim summit in Singapore is whether Japan missed a golden opportunity to get involved in the ongoing dialogue on security in the Korean peninsula and the issue of nuclear missiles. Can that change, now that the second Trump-Kim meeting is scheduled to be held in Vietnam later this month? Yoshihide Soeya tries to answer this question. In the current flurry of summitry involving North Korea, Prime Minister Shinzo Abe’s generally hardline approach makes Japan the odd man out. But that trend is beginning to change. At the UN General Assembly in September 2017, Abe outlined his hardline approach to North Korea in no uncertain terms: “Again and again, attempts to resolve issues through dialogue have all come to naught … What is needed … is not dialogue, but pressure”. 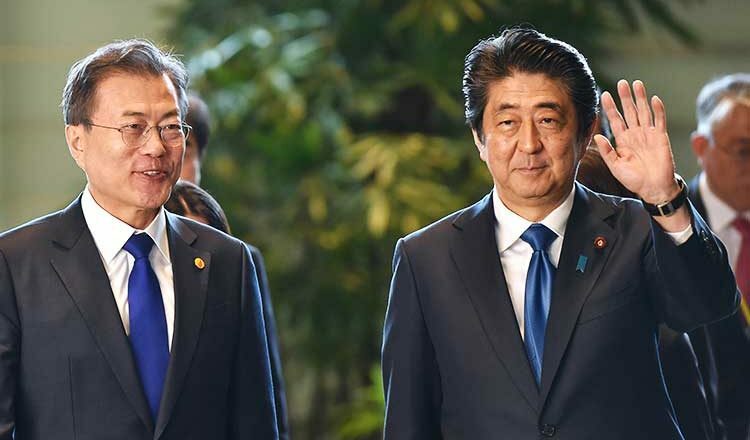 A year later at the 2018 assembly, the same Mr Abe said that he is now “ready to break the shell of mutual distrust with North Korea” and “meet face to face with Chairman Kim Jong Un”. This striking shift in attitude was seemingly caused by the three summits that took place in the first half of 2018: between Mr Kim and South Korean President Moon Jae-in in April, Mr Moon and Mr Abe in May, and Mr Kim and US President Donald Trump in June. The Moon–Abe meeting attracted comparatively little attention. But it was an important occasion that influenced Mr Abe’s attitudes toward both South and North Korea. According to an anonymous source, the initial half of the meeting consisted of one-on-one talks between Mr Moon and Mr Abe. 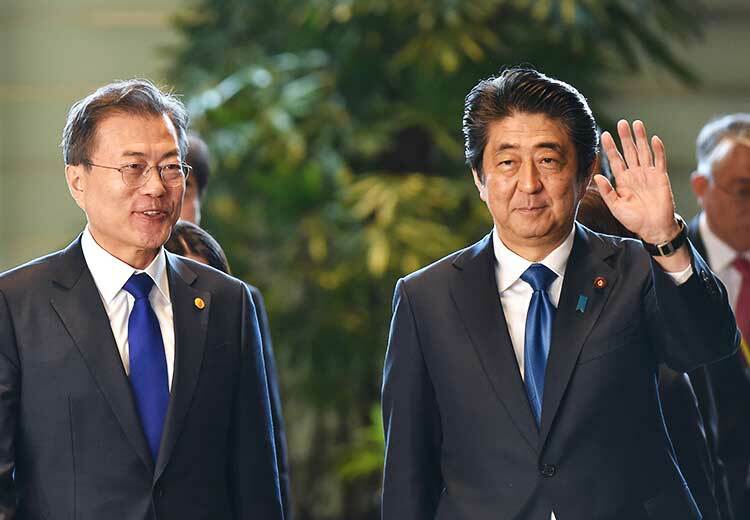 Although the content remains undisclosed, one can reasonably guess that Mr Moon briefed Mr Abe about his discussions with Mr Kim and Mr Kim’s seriousness about his initiatives. Then came the Trump–Kim summit. Although not many surprises came out of it, the fact that such a meeting took place was important. It provided a critical impetus for Mr Abe to begin changing his attitude, indicated by his address at the UN General Assembly in September. The main discourse in Japan after these developments concerns whether Japan missed the bus. Supporters of Mr Abe’s hardline policy tend to argue that it has not, and that Japan should wait until Mr Kim comes courting before seeking a Kim–Abe summit. In the meantime, pressure remains an effective tool while dialogue is seen as a way for North Korea to deceive others, including not only Japan but South Korea and even Mr Trump. A related point made by this camp is that Mr Kim started coming out of isolation simply because pressure worked. Under this premise, the Abe administration is making a not-so-subtle effort to influence Mr Trump’s policy on two main issues: the abduction of Japanese citizens by North Korea and ensuring that Mr Trump does not make concessions easily on security-related issues. Mr Abe has repeatedly expressed his determination to resolve the abduction issue during his tenure, and links it to solving the nuclear issue. It is somewhat ironic that the abduction issue is an obstacle for Mr Abe to the realisation of a meeting with Mr Kim at which Mr Abe wants to find a way to solve the issue. The key to Japan’s strategy toward North Korea is whether Mr Abe can decouple the abduction issue from the nuclear and missile issues, and take an active part in dealing with the latter. If Japan gets involved in the ongoing process of change, naturally the goal should be diplomatic normalisation with North Korea. In this context, it is useful to revisit the Pyongyang Declaration signed by former Japanese prime minister Junichiro Koizumi and North Korean leader Kim Jong Il in September 2002. The declaration lays out a comprehensive framework and roadmap toward diplomatic normalisation, and is still treated as valid by both Tokyo and Pyongyang. Significantly, both sides confirmed in the declaration the necessity of promoting dialogue and complying with related international agreements to resolve the security problems on the Korean Peninsula. International circumstances at the time of the Pyongyang Declaration were different. Aggressive policies from the United States had pushed North Korea into a corner, and only then did Kim Jong Il make a strategic decision to cultivate a slim route to survival through Japan. Among the Japanese, including Mr Abe himself who accompanied Mr Koizumi as deputy chief cabinet secretary, this memory of North Korean concessions must be still vivid. The lesson was that pressure against an isolated North Korea works to the advantage of Japan. Today, US–North Korea relations appear to be evolving in a quite different direction. China is also working with North Korea closely and Russia is supportive of Mr Kim’s bold moves. Now Japan is the odd man out, advocating the most hardline position toward North Korea among the five parties. Under these circumstances, Japan might well be a low priority for North Korea. And this is why Mr Abe has started to change his stance. There remains strong underlying distrust of North Korea in many policy circles in Japan. But in all likelihood, an Abe–Kim summit will be realised only if Japan gets seriously involved in the dialogue process. For Mr Abe to change his current approach, the bottom-line requirement is to assume that Mr Kim is serious about his long-term strategic goals to establish a peace regime on the Korean Peninsula as a means to guarantee regime survival and achieve economic prosperity. Whether denuclearisation will be achieved in the process is still uncertain. What is needed now is a strategy of flexible response with a measure of trust in Mr Kim’s proclaimed end-goals, backed by a firm resolve to denuclearise North Korea. There are always chances for the process to stall. But the important thing for the rest of the international community, including Japan, is not to turn expected failures or delays into self-fulfilling prophecies. Does Mr Abe have the skill and cunning to pull off such a gesture? This will be a major challenge on the road to a Kim–Abe meeting.